A week late, I know. I've been ridiculously busy and I have not even gone more than a few light years these past two weeks, its just been mine, eat, mine, sleep, repeat. First thing is first though, you know what I said 2 weeks ago about me thinking that I was close to Elite Status? Well I now have joined the Elite! A few days after I docked, Deep Space Surveys, who are running the station, bought the cartographic services online. I sold my huge batch of data for a nice wedge of credits, gaining numerous first discovered systems, earth like worlds and water worlds. Within a few minutes I had the notification come over my comms. "Right on, Commander, The Pilots Federation has bestowed its greatest honour on you and granted you the explorer rank of elite". I stared at the animated Elite emblem for a little while, feeling like I had just won the Federal Grand Lottery, a proud moment indeed. The second Mining operation kicked off back on the 7th with just as much enthusiasm from the fleet as the first. 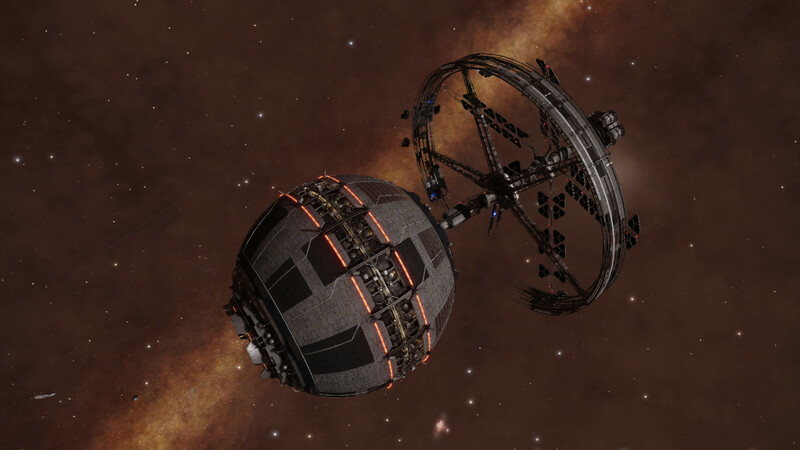 There was a surprise announcement too, apparently as the fleet had mined so many extra tonnes of resources during the first operation it had been decided that a mega ship, The DSSV Distant World, would be built and situated in the same system as the new station, however, it's purpose still remains to be seen. We needed to mine tonnes of bauxite, water and liquid oxygen that the builders had specified was required to complete the projects. After the haulers had caught up to the fleet and delivered all my mining gear from the Omega Sector, I oversaw the refit and turned my ship back into a full-on Mining rig for the last time. Once again, I felt instantly at home dropping into a gas giant's rings in a system next door, I could have been back in Delkar, apart from the intense backdrop being filled with hundreds of thousands of additional stars. If you'd told me a year ago that I would end up mining in the center of the galaxy, I would have laughed at you and told you to lay off the stims! This past month has been unlike any other, that's for sure. After chatting to the pros from the mining union (IMU) I settled into mining a bauxite hotspot for the week, less strenuous than shifts back home when we used to cram in multiple contracts at the same time, but still exhausting. All the while I could see the progress being made on the station, the habitat ring being built piece by piece, growing each day. My little Phantom did me proud once more, having allowed me to mine a not insubstantial amount of 1082 tonnes. The fleet smashed the requested quantities required again, although not reaching above 10.5 tiers this time. We will be leaving our mark on this extreme, remote spot in the galaxy, contributing to studying the super massive black hole and creating a haven for future expeditions for numerous decades to come. With the hard work done it was time to relax and unwind before the longest most dangerous part of the expedition started. During the downtime, I'd got chatting to a few mechanics that were members of the Hull Seals, the dedicated lot that have been repairing explorers in need during the expedition. During a drinking session, they had joked about me letting them loose on my Phantom to give it an overhaul and face lift. As a treat to myself, I took them up on the offer and they eagerly went to work, once we were all sober obviously. The Voids Flame is now kitted out with two new tail fins, an engine exhaust heat shield and an overhaul of the exhaust systems, with new heat exchanger units and inlets build into the top of the ship that elegantly sweep down to the wing edges. I also had her completely repainted along with adding an Explorer Elite emblem above the cockpit. She now looks like a completely different ship, it’s like Delacy have released the Phantom MK2 and it's just flown off the ship production line. Pretty sure she won't be looking quite so shiny by the time I next dock at a station though. I managed to sleep through the mass jump at the weekend when the fleet moved on. I was ready to go, pre-flight done, nav points set and I somehow managed to fall asleep strapped in to my flight seat in the cockpit whilst in the hanger, the long “days” and my messed-up body clock having got the better of me. I managed to join a small group of commanders outside the station and we jumped once more onward, saying farewell to any form of civilisation. Here I am then, some 2,000 ly from Sagittarius A* but not even half way to the next waypoint, numer 8, at 'Lower' Goliath's Rest in Hypiae Phyloi LR-C d22. It’s going to be exciting and scary from here on out, with focus purely on science and exploration. There are over 50,000 ly still to go with only a third of our journey behind us. I must admit I have not even thought about the return trip from Beagle Point, neither do I want to, not yet anyway. So, no more stations, outposts or mega ships to land at, nothing but the black and new discoveries await us.